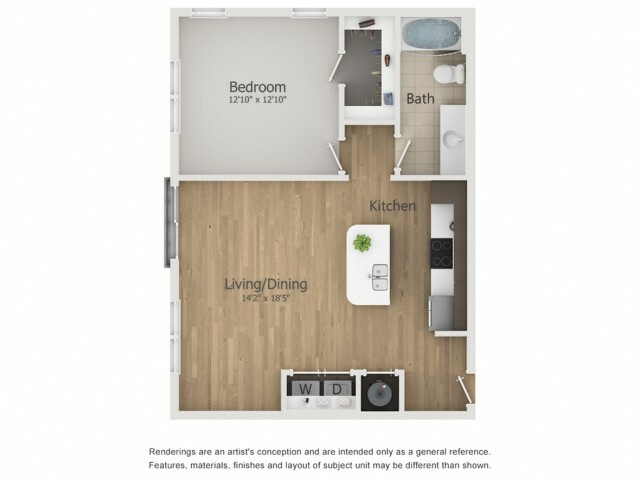 The B2 Oliver unit at 935M Apartments in Atlanta, GA, is perfect for small families or roommates, at 980 square feet. Each bedroom includes its own bathroom with deep-soaking tubs and walk-in closets. This unit has a gourmet kitchen with granite countertops, a center island and a stainless-steel appliance package. Our 10-foot floor to ceiling windows guarantees you will always have a gorgeous view of Atlanta’s skyline. Stained concrete flooring adds to the modern and luxurious feel of the B2 Oliver apartment. You have washer and dryer connections in-unit as well. We have a generous pet policy that lets you have up to 2 furry friends per unit. 935M Apartments is a green apartment complex. Each until is equipped with a programmable thermostat, energy-efficient appliances, and lighting. We are NAHB Green certified with a silver certificate and a support a recycling program that is included in the rent. When you are ready to upgrade your lifestyle in Atlanta, 935M is waiting for you. There is no shortage of on-site amenities at 935M Apartments. If you lead an active lifestyle, then look to Torq Cycle and Relay Bike Share for easy biking options. Located in the distinguished neighborhood of West Midtown, 935M boasts several on-property retailers, restaurants and is within walking distance of many more. Our resident-only fitness center and yoga studio make working out convenient and easy. You have a resort style swimming pool on the premises to enjoy as well. If you enjoy entertaining friends and family, we have an outdoor grilling area and lounge complete with shuffleboard and billiards. For dining, you have Pauley’s Crepe Bar and Le Fat, and our proximity to the I-85 allows easy access to the rest of Atlanta. 935M is located near Georgia Tech, making it a great choice for faculty, students, and staff. Our resident’s portal makes it easy for you to request any maintenance needs and pay rent. At 935M, luxury living is at your fingertips. For a walk-through and tour our facilities, stop by today.